In June 2013 City Space Architecture started to work on the research project "Pop-up City", in the city of Bologna, as a part of the international research project "Past Present and Future of Public Space", coordinated by our President Luisa Bravo, in collaboration with the photographer Fabio Mantovani. Working on different locations, the "Pop-up City" project intends to highlight existing places with a potential for public life, looking for invisible dimensions of the public realm, searching for an "ordinary magic" along everyday streets, squares and neighborhoods, delivering new powerful images of the urban world. We explore in particular those suburban places generally disconnected from the mental representation of the urban narrative plot of public spaces, made of beauty and fascination, with no identity and continuity with the historic environment. We are moving further from the European mental attitude that immediately links the concept of “public space” to the idea of a traditional designed square. These places are part of the everyday existence, but common people are accustomed to experience them as fragments in a sort of jump-cut urbanism, affected by the use of cars. We pass through but we don’t see. The Pop-up City project is trying to document what is now largely undocumented. 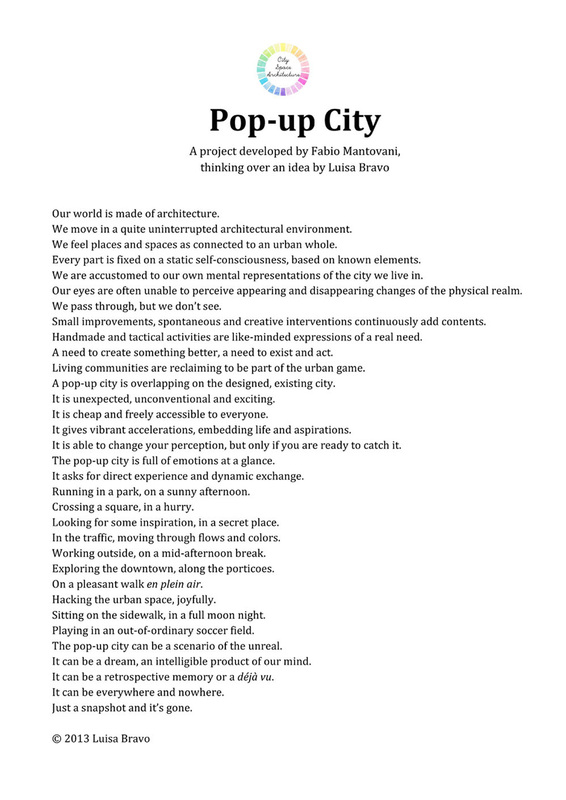 We are representing the city of Bologna, but actually the Pop-up City could be anywhere. To read the curatorial statement, click on the image on top left. Some reflections from Pop-up City #11 photographic session at Giardini Margherita, Bologna. 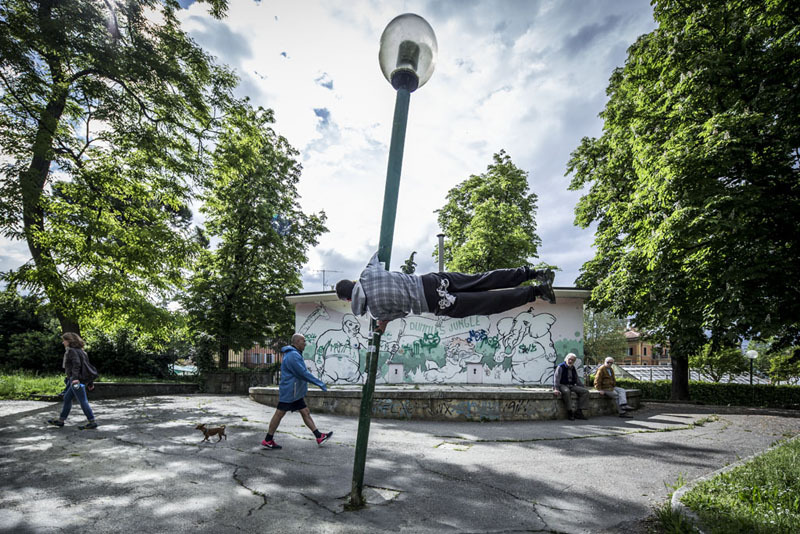 During the past year we worked on investigating some bottom-up actions and informal practices able to transform and enhance public space and its perception in the city of Bologna. Our challenge was: can we deliver a powerful idea of the surrounding everyday space, often taken for granted, through a single picture? Together with the photographer and member of our Board of Consuls Fabio Mantovani we looked for different locations, sometimes hidden or car-crossing spaces, sometimes suburban places, that we intended to enlighten. Working together with Fabio means putting yourself in the line, leaving the mind open to unforeseen experimentations. One of our locations was the biggest park in the city of Bologna, the Giardini Margherita. In this park in the Seventies you could even find some lions who lived in a dedicated cage, in a sort of small successful zoo. Today the lions are no longer there but the space they were living in has remained: once the grid was removed, a raised platform and a wall were erected, someone then painted a mural representing a jungle. The collective memory of this place is still so vivid and strong in the Bologna community that even today’s teenagers, who never saw the lions, meet at “the cage of lions”. Close to this meeting point there’s a primary school: every afternoon, as after-school activity, lots of children get out and meet at “the cage of lions” place, to stay and play, together with their parents. Last April we launched on our website a national competition for short films, entitled "Beyond the Ideal City", as a part of the "Past Present and Future of Public Space" international research activity, involving art, architecture and urban design, in partnership with Cineteca di Bologna and Ottagono.com. The deadline for submitting proposals was June 3, 2014. According with the competition announcement, we were planning to award the winner on June 25, during the cinema session of the "Past Present and Future of Public Space" international conference, that took place in Bologna, June 25-27. We created a Facebook page for this event, look here to get more news of what happened! 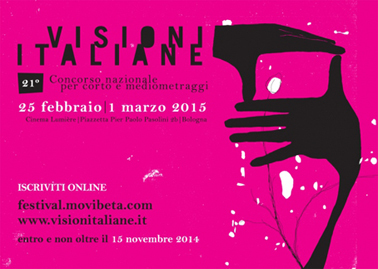 But just few days before the conference, while we were watching the submitted proposals and discussing with the jury, we received the offer from Cineteca di Bologna to include our competition in the next "Visioni Italiane" [Italian Visions] Festival, a well-known Italian competition for short films. That was really a great offer for us! Together with Ottagono.com we decided to postpone the call for proposals, as a brand new section of the Cineteca Festival, entitled "Urban Visions | Beyond the Ideal City". The international conference "Past Present and Future of Public Space," which will take place next June 25-27 in Bologna (Italy), is getting closer! But there is still time to contribute. 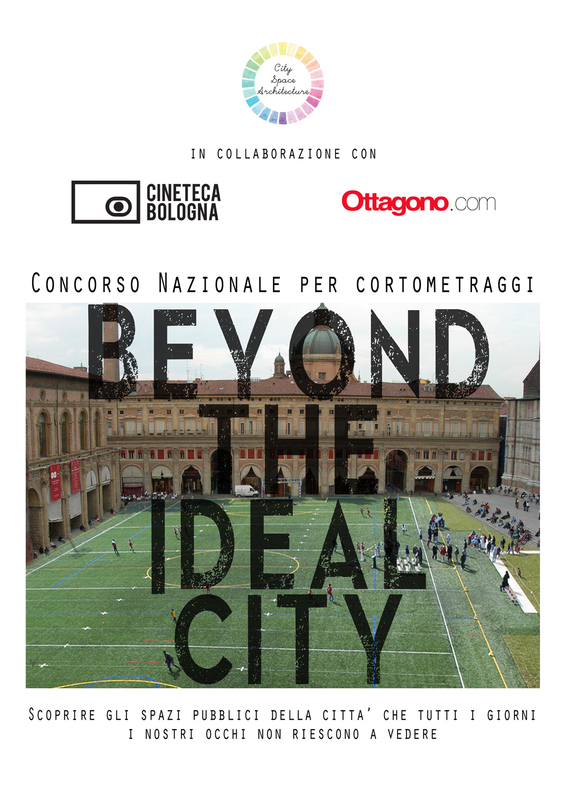 We are very proud to announce that City Space Architecture in collaboration with the Cineteca di Bologna and Ottagono.com have just launched a national competition for short films, called "Beyond the ideal city". Not just words then, but also images, stories and emotions to describe and discuss the Past Present and Future of Public Space. In line with the international academic research project, the main purpose of this competition is to investigate the contemporary city, the connections, intersections and urban activities that take place inside it, seen through complex social issues, contexts and human geographies. Forgetting those seducing shapes of the ideal city, the competition asks to explore the public realm beyond the stereotypes and well-known images of consumerism, looking for hidden aspects that our eyes, deliberately or unconsciously, in the daily experience don't want or cannot see. The deadline for sending short films is June 3, 2014. No registration fee is required. On June 25, during the international conference, in a special session at Cinema Europa (via Pietralata 55), the jury will award the winner in front of a large audience, with the "Prize Ottagono.com", worth euro 2,000 in cash. The short film will then be presented and discussed. The competition announcement (in Italian) can be downloaded HERE (as a .pdf file). "Past present and future of public space" is an Italian project, developed as an academic postdoctoral research activity by our President Luisa Bravo during the past two years, at the Department of Architecture, University of Bologna (Italy). It aims to explore new dimensions of public realm and to discuss results of research activities, through a multidisciplinary approach, on public space and related topics, comparing theories and projects with advisors and correspondents from different contexts. Started in 2012, the project has involved many international scholars and professionals. First results were presented and discussed at the Biennale dello spazio pubblico on May 2013 in Rome, during an international session promoted by City Space Architecture and coordinated by our President Luisa Bravo, and then published in a special issue of the open access e-journal "IN_BO. Ricerche e progetti per il territorio, la città e l'architettura", entitled "The public space of education", edited by Luisa Bravo and Claudio Sgarbi. During the Roman session a call for proposals has been launched in order to invite scholars, architects, urban designers, planners, photographers and artists to join the project. The research project was then discussed in Bologna, on 9 November 2013 during a symposium and exhibition at Quartiere San Vitale, Municipality of Bologna, promoted by City Space Architecture. The international conference that will take place in Bologna, next 25-27 June 2014, is intended to be the final result of this research activity, as a large public event.